Mention Japanese or Chinese art and immediately a few images conjure up in the mind...of samurai, quaint old bridges, softly rounded hills and more. Mention Indian art and the mind is deluged with a variety of images, none of which can be considered singularly representative of Indian art. Yet, the work of artist Jayasri Burman, exhibited at Delhi's Shridharani Gallery recently, definitely reflects a quality of 'Indianness'. Choosing everyday reality as her primal force, Burman - now 44 - creates visual narratives of genuine Indian content. Aptly termed 'Anubhuti', her recent works portray creative realism using sensual feminine figures and familiar feminine accoutrements. There are flowers in the hair, a becoming nose stud in place, kohl rimmed eyes and the sari-draped in becoming contours, designed in a conglomerate of wavy lines. The male figures alongside some of these portrayals uplift the mundanity of human partnership into a palpable tenderness, linked to anecdotage. Pointing to one such piece Burman explains, "She had left behind her rickshaw- puller husband and a teenage son who was appearing for his board exams, to work in a metro city to earn a little extra, and to tide over the expenses of the boy's education. All through this forced separation she pined for her husband and when she related this to me, I pulled out pencil and paper and made a sketch of her straightaway." Besides such chance encounters, Burman's art springs from her upbringing. Born into an aesthetically oriented family of Kolkata, she was exposed to art very early in life. 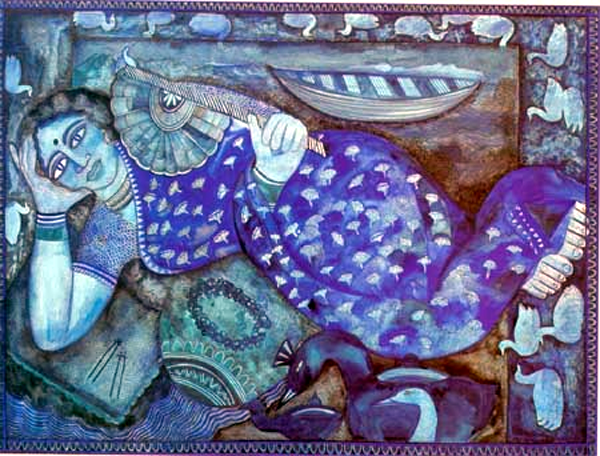 Her uncle, the reputed artist Shakti Burman (based in Paris) exerted a strong influence over her developmental years. Having studied at Kala Bhavan in Shantiniketan, and the Visual College of Art, Kolkata, Jayasri went on to receive guidance in print-making under Monsieur Ceizerzi in Paris, a fallout of the avuncular interest. Her technique therefore, became an amalgamation of fine linearity combined with an undercurrent of free expression. When she began showing her work at galleries, a notable beginning was in Kolkata when an exhibition of five women artists of Bengal was held to commemorate the tercentenary of the city (1990). Then, in 1992, Burman's exhibition 'The Baijis' at the Chitrakoot Gallery (Kolkata) earned rave reviews, and the Birla Academy of Art and Culture, Mumbai, followed it up with another success titled 'Urban Signals Shifting Images'. In the following years, Burman's work has been exhibited frequently in India and abroad. 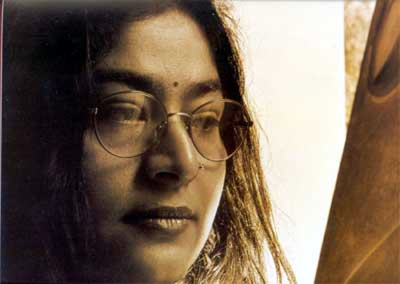 Besides her exhibitions in London, Paris, Berlin and Hong Kong, Jayasri initiated a unique exhibition of the Burman family artists, titled 'The Family', along with Shakti Burman and cousin Maya Burman. In 2005, this show of the family's work was held in Mumbai. Burman insists that her art has been a reflection of her personal life. Even though she had always been fond of art, the decision to become a professional only blossomed into a serious pursuit after her marriage with artist Paresh Maity. "Paresh was a frequent visitor at our home because of my uncle. On one of these visits I ventured to show him a few of my works and he invited me to join him in an art camp he was organising at Ajmer. At first I was diffident about my abilities and shied away but Paresh was hurt at my hesitancy and brusquely chided me about being content to wallow in mediocrity and anonymity. I was piqued and decided to join the art camp." Post marriage, her commitment to art became integral to her thought process - symbols and motifs seamlessly wove themselves as references from her childhood. "On starry nights, while we sat on the terrace, our elders would relate mythological stories and all those characters would mesh into themes that emerged as art motifs in my work. Now, when I am asked where I get my mythological references for my work, my answer is that they do not coincide with any authentic narrative but are figments of my childhood imagination that have surfaced on the canvas as figures and forms that I paint." Thus the Brahma depiction at the top of one such conglomerate stimulates one's memories of myths but none of the known ones seems to fit this jigsaw of terrestrial and ethereal detailing. And then there are the colours from her palette, of which red is predominant. Contrasts are produced through stark white or turmeric or ochre or blue and the subjects change from mythology to reclining females, rotund and indulgent, complete with hand fan, a cluster of soft pillows and the sensuous pleasure of a leisurely afternoon nap. Lingering over the composition, one can almost feel one's eyelids begin to droop and the feet begin to sag. "Her face is not real," says Burman, "but I make sure that all my creations are natural. She is the charming delicate side of woman; her comfortable posture suggests a kind of intimacy, as we all like to indulge ourselves." From ice blue maidens and deep dark pools, Burman's art has taken a quantum leap into flirtatious oranges, strident sunlight, and the earth sprouting into fantasy growth. This is the unrestrained, experimentally inclined side of an artist who wants to make a statement of breaking free in symbolic and narrative terms. Yet the leitmotif of water creatures, are ever recurrent in her cosmos of vermilion and sunshine. Is this a limiting factor then? The artist is candid. "I don't know but I can't think of painting without them. In real life I can't swim despite my father taking me to the water's edge and trying to coax me into the waters. I just sat on the pool edge, admiring the other folk in the water, fascinated and drawn by the sense of adventure and yet not having the courage to step in myself." Perhaps Burman is this onlooker sitting by life's edge - creating exuberant tones, holding everyday reality in an impressionistic sheath, painting memory, legend, and a little bit of her own self, into a splendid panorama of myth and reality. after a lonf long time came acress an article of jaya. i am a distant cousin of hers and live in kolkata ( lake town) . i always admired her form of art and appreciated her paintings. it would be wonderful if she goes through this comment and writes back to me. she calls me "bula" da....my nick name.